As a student at an all-girls’ Catholic high school in Southern California, Andrea distinctly recalls she didn’t have the great number of Latina peers she’d met through LDZ and a subsequent CWS program in Santa Clara. She was certainly reading Latino and Latina authors and thinking about her identity, but NHI helped her bring that perspective into focus like nothing she’d encountered in school. Andrea’s journey was further propelled by NHI, when she learned that the college she wanted to attend, DePaul University in Chicago, offered scholarships to NHI students. She continued her public policy studies via graduate school at the University of California at Berkeley, worked as a legislative aide in her home state, and was then hired for the first of a number of public policy posts at the Department of the Treasury. At one point in her career, she was working in Washington, D.C. but Skype-ing into her graduate classes at Berkeley to keep moving toward her degree. 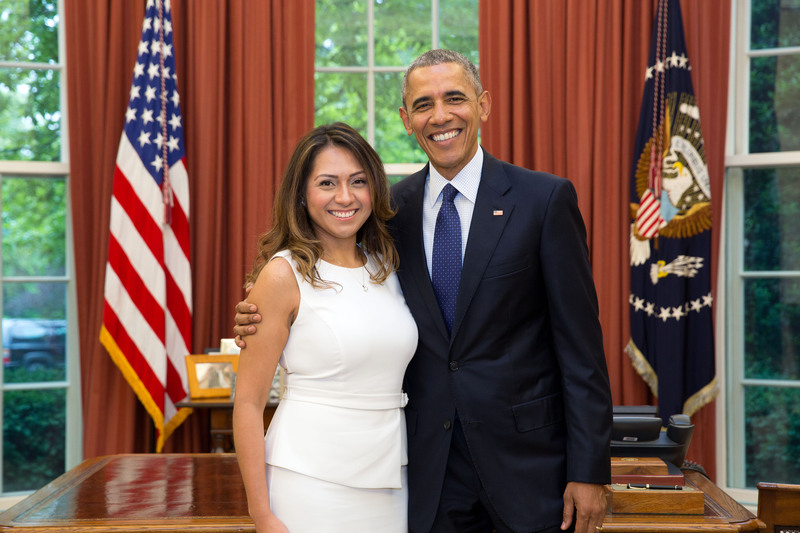 After being part of a three-person team at the Department of the Treasury, for an 18-month project to help launch a new retirement savings account program for the private sector, called MyRA, Andrea was hired by the White House to become the Deputy Director of Private Sector Engagement. The first-ever White House Briefing on Diversity in Corporate America, which took place last month, was a particularly important focus for Andrea. Valerie Jarrett, President Obama’s longest-standing senior advisor, spoke to Fortune recently about the event’s importance in contributing to a necessary culture change. Though Andrea is focused on professional responsibilities that could potentially be all-consuming, she’s also focused on her own community through mentoring young Latinas – a continuation of community-building that goes back to her days at DePaul, where she worked to help create a scholarship program for Latino and Latina high school students. As President Obama will be leaving the White House next January, Andrea’s thinking about her next post. Inspired in part by the latest State of the Union speech and its call for businesses to serve the greater good, Andrea is contemplating moving from government to business as a next step. But she’ll do so with an awareness of how integral community is to public policy – lessons that first came to life for her at NHI. May 27, 2016 at 4:21 pm Varo M.
Congratulations Andrea! It’s important and at times difficult to stay rooted in your beliefs as you move forward. You’re a great example and role model for those that follow behind you. Adelante mujer!